Our system of government is a constitutional monarchy and a parliamentary democracy. Her Majesty Queen Elizabeth II is Queen of Canada and Head of State. The Lieutenant Governor is appointed in the name of The Queen, by the Governor General, on the advice of the Prime Minister of Canada, for a period of not less than five years. The Lieutenant Governor is the representative of The Queen in Newfoundland and Labrador; this position is non-partisan and apolitical. The Lieutenant Governor acts on the advice of the Premier and the government, but has the right to advise, to encourage, and to warn. One of the Lieutenant Governor’s responsibilities is to ensure that Newfoundland and Labrador always has a Premier. The Lieutenant Governor presides over the swearing-in of the Premier and Cabinet Ministers. The Lieutenant Governor summons, prorogues, and dissolves the House of Assembly, delivers the Speech from the Throne and gives Royal Assent to Bills of the Legislative Assembly. The Lieutenant Governor signs official documents and meets with the Premier. The Lieutenant Governor presents honours and awards to people who have demonstrated excellence, valor, bravery, or dedication to service that brings credit to the province and the country. Each year, in ceremonies at Government House, the Lieutenant Governor presents a number of awards for long service, for outstanding public service, and for achievement. 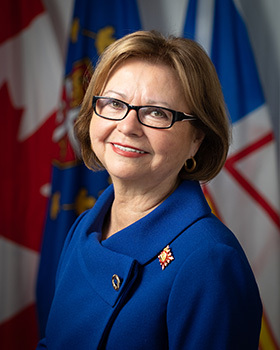 She presides over Investitures of the Order of Newfoundland and Labrador, the Order of St. John of Jerusalem, the Royal Life Saving Society of Canada, and other organizations. The Lieutenant Governor participates in commemorative ceremonies, provincial celebrations, and community activities throughout Newfoundland and Labrador. The Lieutenant Governor also hosts events at Government House in St. John’s and at other venues throughout the province. As the representative of Her Majesty, the Lieutenant Governor acts as the representative of the Province of Newfoundland and Labrador. The Lieutenant Governor receives official calls by dignitaries visiting Newfoundland and Labrador. The Lieutenant Governor hosts Members of the Royal Family, visiting Heads of State, diplomats and other official visitors to the Province. The Lieutenant Governor engages in meaningful dialogue with Newfoundlanders and Labradorians from all regions on issues important to the well being of the province, through multi-disciplinary roundtables and discussions, public gatherings and a varied program of community events. Such issues may include a variety of topics such as gender equality, community building, diversity, literacy, mental health, innovation, the environment, science and our unique place in Canada and the world. The Lieutenant-Governor is appointed by the Governor General, on the advice of the Prime Minister of Canada, for a period of not less than five years. Premature terminations can only be for cause. Extensions are possible following discussion between the Prime Minister and the Lieutenant-Governor. This page and all contents are copyright, Government of Newfoundland and Labrador, all rights reserved. Disclaimer/Copyright/Privacy Statement.